New Club President Om Sukheenai. Thank you and kudos to outgoing President Todd Engle and his Board of Directors. 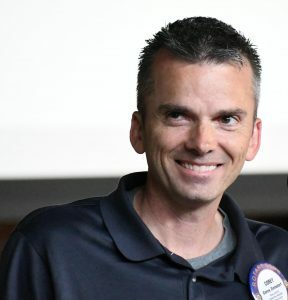 Outgoing Club President Todd Engle officially installed Om Sukheenai as our new leader during a jam-packed Installation Dinner event June 14 at the Methven Family Vineyards in Dayton. Om unveiled the new Rotary International theme for the year, “Be the Inspiration,” and shared her own inspiring story of immigrating to the U.S. from Thailand. 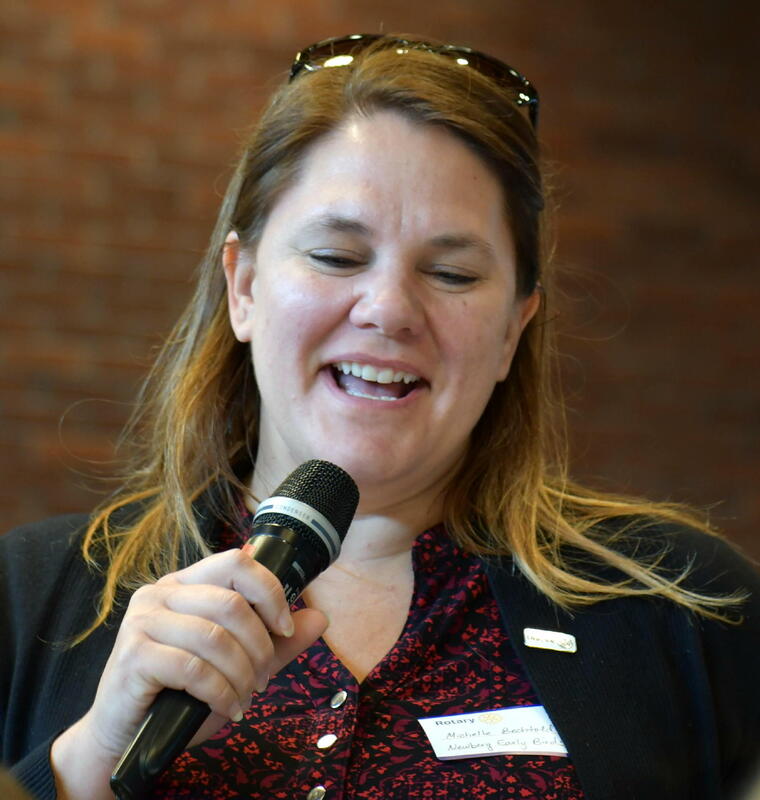 She laid out her leadership principles and said she looks forward to working with her board to implement the strategic plan and vision recently developed by club members. Outgoing President Todd Engle and Corey Zielsdorf give a certificate of recognition to International Committee Chair Laura Tilrico for her work on many, many projects, including in Nepal and Guatemala. Rick displays his special 50th anniversary gift. 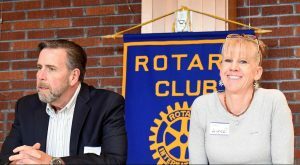 Rick Kaufman’s daughter and son-in-law attended the Installation Dinner to help celebrate his 50 years of Rotary service. 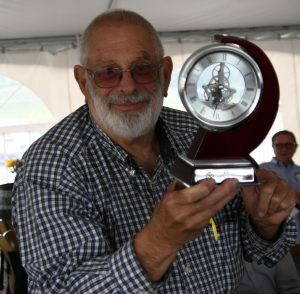 He has been a club president (twice), and is probably best known for being one of the founders of the Concours D’Elegance car show in Forest Grove, a Rotary-sponsored event. He is a retired dentist who stays busy as a woodworker and bonsai expert…and has a long list of other interests. Congratulations, Rick! Ann and Patrick Dolan attended the Installation Dinner and received awards and recognition for Bill Dolan, who would have celebrated 30 years of Rotary service this year. Bill passed away in May. 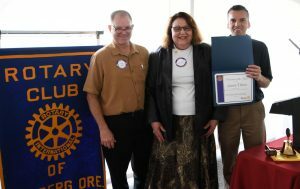 Guest speakers Paul Petillo, with Fred Meyer, and Diane Longaker with YCAP. Suzanne Miller introduced Paul Petillo and Diane Longaker to discuss the subject of “waste food”, its challenges, and ways it is dealt with in our area. 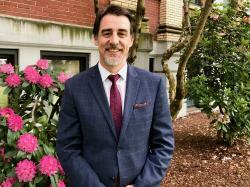 Paul is the corporate executive with Fred Meyer responsible for policy and logistics in company as regarding minimizing food waste in their operations. 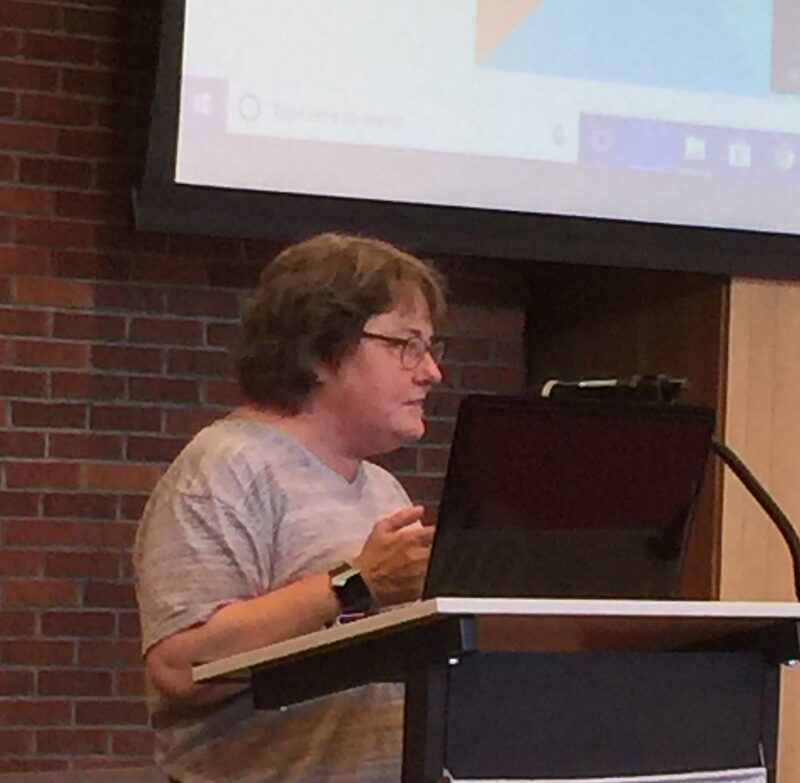 Diane is Resource Development Coordinator for Yamhill County Action Partnership [YCAP] Food Bank. Both spoke of concerted efforts to reduce food stuffs from going into landfills. Paul spoke of how very tightly Fred Meyer monitors/manages all food commodities they buy, sell and dispose of [if/when needed]….with “best practices” resulting in still-safely-consumable-but-no-longer-marketable products going to entities/organizations such as YCAP Food Bank for appropriate re-distribution. Diane addressed the Food Bank’s efforts in dealing with all those in the “food chain” from farmers & producers/processors on through “food banks” and others assisting the “food needy” in our communities…and on to final disposal of un-usables…such as “anaerobic bacterial digesting” into fuel for electric power production….a process management detailed by Paul. Using the proceeds from our auction in April, the Club has awarded over $50,000 in scholarships to 39 local students. 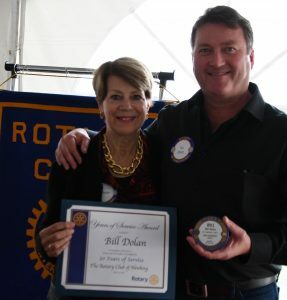 New this year was the $3000 Bill Dolan Scholarship, named in memory of 30-year Rotarian and St. Paul Rodeo Hall-of-Famer Bill Dolan, who passed way in May of this year. Presley Smith, St. Paul High School Valedictorian, is the first recipient of that award. 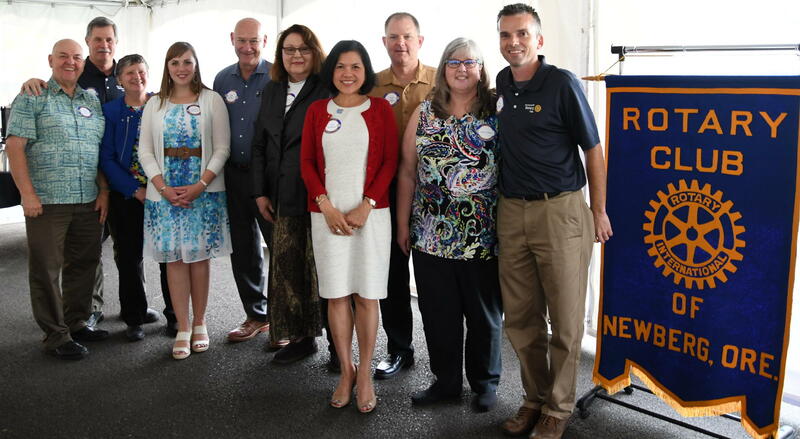 Six of the larger scholarships are named in honor of local Rotarians and citizens, in recognition of their contributions to the community: Bill Dolan, Joan Austin, Ken Austin, Ray Simonsen, Larry Bohnsack and Crystal Dawn Smith Rilee. A “Service Above Self” award was given to Scholarship Committee Chair Dave Parker for his leadership and service to the club. 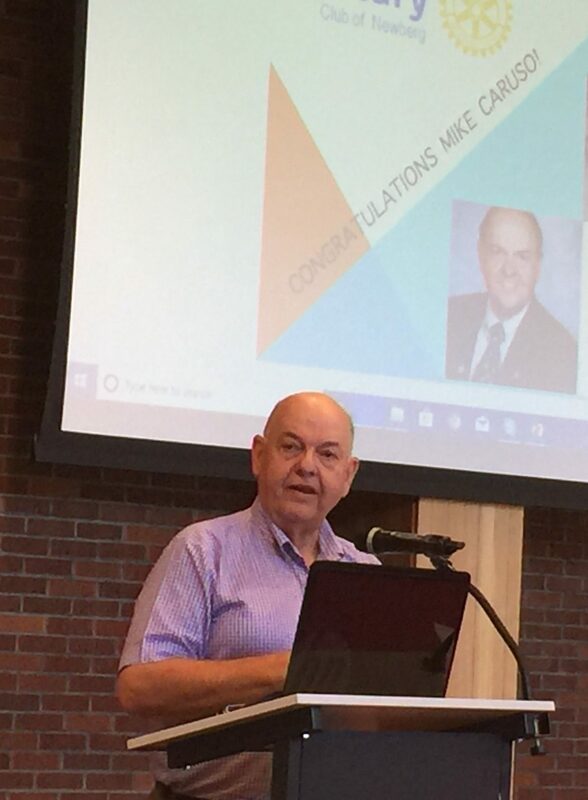 Dave has accepted a new job as the Superintendent of the Forest Grove School District and will be leaving the club. Thanks and best wishes, Dave! Former Auction Chair Grant Gerke is also leaving the club. Grant was recognized for his hours and hours of tireless service as Committee Chair for many auctions and other projects. Thanks and best wishes, Grant! 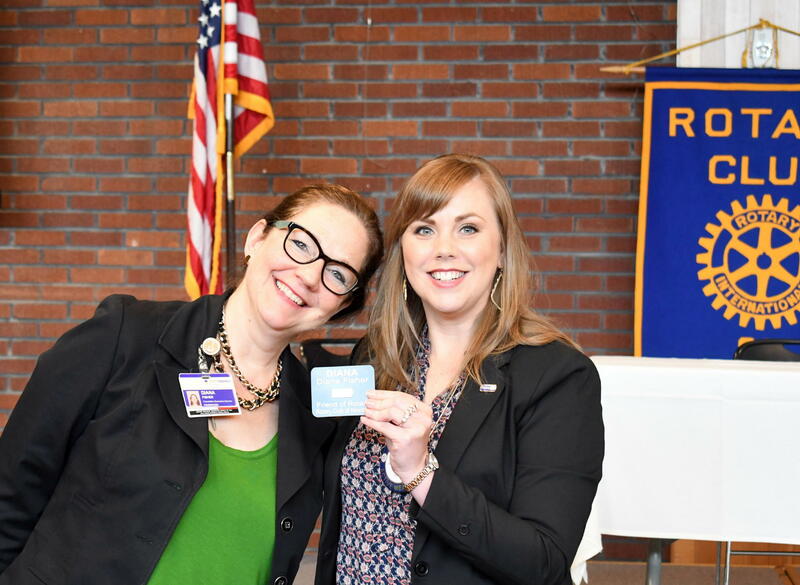 Membership Committee Chair (and new Chamber of Commerce CEO) Shannon Buckmaster (right) officially welcomed Diana Fisher back to our club as a “Friend of Rotary.” Diana said she has been gone for 5 years out-of-state. 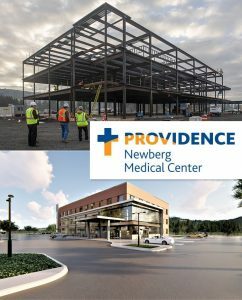 She is now the Executive Director of the Providence Newberg Health Foundation. Welcome, Diana! 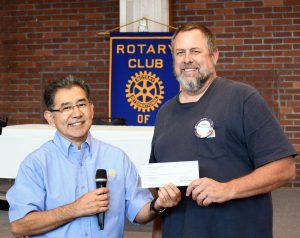 Auggie Gonzales, Club Foundation Board Member, presents an auction- proceeds check for $30,750 to Mike Pollock for support to the Helping Hands organization. 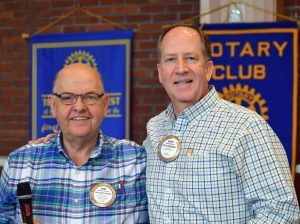 Jim Hirte has returned to the club after 5 weeks in Mexico and 4 weeks in Galveston, Texas. Welcome back, Jim. MARK YOUR CALENDARS AND SELL PANCAKE BREAKFAST TICKETS! 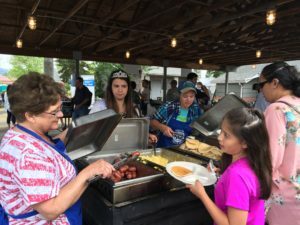 The annual pancake breakfast, sponsored in conjunction with the Morning Club as part of the Old Fashioned Festival, will be here before you know it. Good news–this year, the requirement to buy $72 in tickets has been dropped. However, there is still a “requirement” to sell tickets, help get sponsors and volunteer for the event! Curt Walker has once again stepped up to lead this project and is the man to see for more information. Lydia and Jackson, wife and baby son of Dan Keuler, joined Dan for lunch. Sara James Vandehey, cousin and guest of Shannon Buckmaster, attended our meeting to check us out. 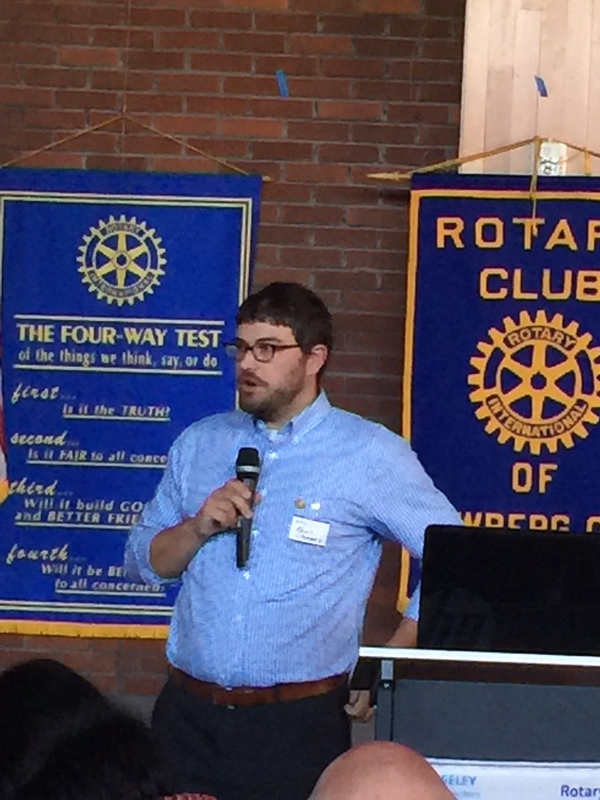 Corey Zielsdorf presented the findings of our recent visioning session. Imagine it’s 2023. What do you think our club will be like then? What would you like it to be 5 years from now? Defining that was the purpose of our May 3 visioning exercise led by Corey Zielsdorf, who reported out on the results of that session last week. Know every members’ talent and why they chose their career. Inspire Youth. 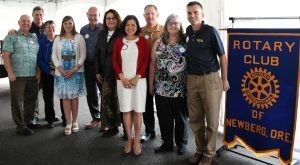 Expand Guatemala project to include OHSU and Pacific U. Thanks to all who participated in our Vision facilitation to plan our club’s future! So exciting! The design (above) of the mural planned for the side of the Steve’s Auto Body Shop building on Highway 99W in Newberg was unveiled by the four George Fox University student artists working on the project: Ben Cahoon, Sierra Ratcliff, Annabelle Wombacher and Jared Mar. Sierra told us the design–a series of hands with geometry as an aesthetic in the background– symbolizes community, connections, generosity and service. “We came up with a series of hands,” she said. “‘Giving hands’ symbolize service, ‘receiving hands’ symbolize thankfulness and gratitude. ‘Embracing hands’ hold together the community and its values.” Permitting for the mural is now underway, and once finalized, painting will begin. The mural will include a Rotary logo at the bottom left. A big “Thank You” to Sherwin Williams for donating the paint. Still time to get tickets for this year’s event! Always a nice evening in a scenic setting with a chance to sip some wonderful wine. Weather is supposed to be perfect. Come participate in this year’s “changing of the guard,” as Todd Engle finishes his year of presidency and Om Sukheenai is installed as our new one. 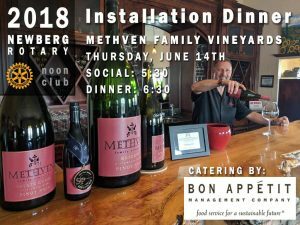 Event is 5:30 to 8:30 pm at Methven Family Vineyards. Tickets $30 each. Please RSVP to Paula Radich. 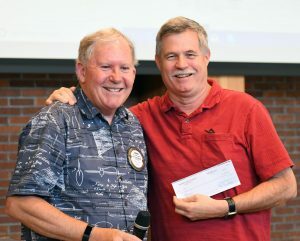 Club Foundation representative Spike Sumner, left, presents CPRD Aquatic Center Project Manager Jim McMaster with a check for $30,000 from the club towards the new community pool. Club President Todd Engle attended the grand opening ceremony (below) last Thursday and took this photo. Ever been at a restaurant where the portions were so huge you couldn’t finish the food and just left it on your plate? Ever wonder what happens to all the produce that is heading past its prime at your grocery store? A panel discussion on food waste and recovery in Newberg as a way to address hunger is the feature for this week’s meeting. Representatives from Fred Meyer, J’s Restaurant, and the Yamhill Community Action Partnership will join us at the Cultural Center. A date has been set for the upcoming Habitat for Humanity build project. According to Shannon Buckmaster, the event will be Sept. 15 from 8:45am to 4:30pm. Lunch, all tools and training provided. Please contact Shannon if you can volunteer. A female tribute band to Meryl Haggard called “Geryl Haggard” will play at an upcoming fund-raiser for Peace Village Global on June 24. Proceeds will go towards an upcoming Peace Village camp in Tripoli, Lebanon that our club is supporting in conjunction with the Rotary Club there. Come on out for pizza and some good music. Sunday, June 24 from 5 to 8 pm at Mississippi Pizza, 3552 N. Mississippi in Portland. Donations at the door. Marge O’Connell is planning a trip to Newfoundland and will miss a couple meetings. Have a great time, Marge! PDG Mike Caruso led a committee conducting interviews for District 5100-sponsored Peace Fellow candidates last weekend. A record 10 people, from places as diverse as India and Africa, as well as Portland, applied and were screened via personal interview. Eight candidates were recommended for additional review. 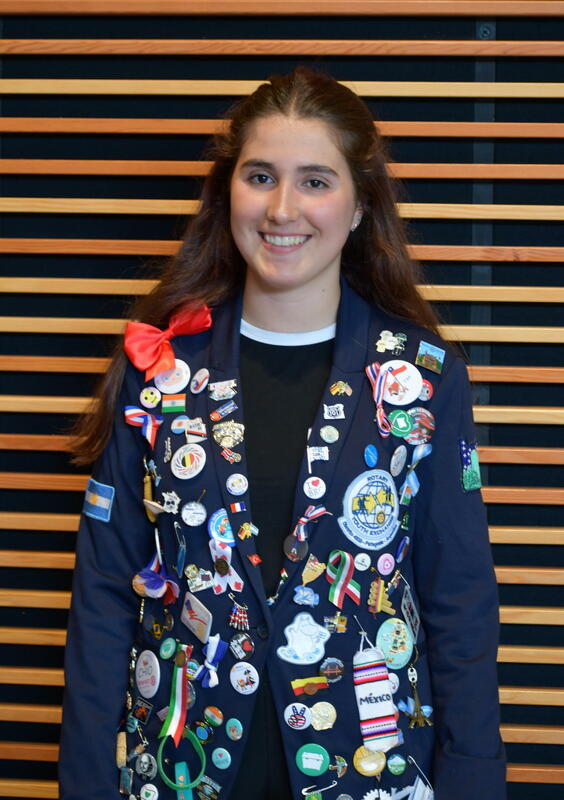 Selection of the final candidates by Rotary International will be in the Fall in Chicago. Shannon Buckmaster was named the new CEO of the Newberg Chamber of Commerce. Congratulations, Shannon! Shannon also reported on a wonderful new idea from the Membership Committee. 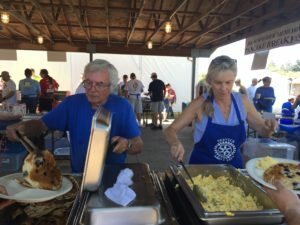 They will coordinate a “We Care” effort for club response to members’ illness, hospitalization, surgery, family member loss, or other events and milestones. They will determine if perhaps a home visit, card, meal, or other action is needed and organize the information/response. If you hear of a situation like this that you think needs a club response, please contact a Membership Committee member. Most Americans probably think of Argentina as a warm-weather country. 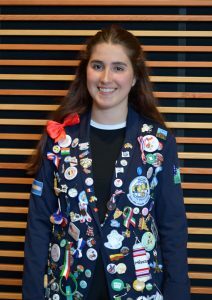 So it was surprising to learn from Rotary International exchange student Clara Perez-Rossi that she is from the southern part of that country– where there are glaciers, snow and penguins! Clara is from Bariloche, a small town located just 15 minutes from mountains and ski resorts. She educated us on this and other aspects of this South American country at our meeting last week. 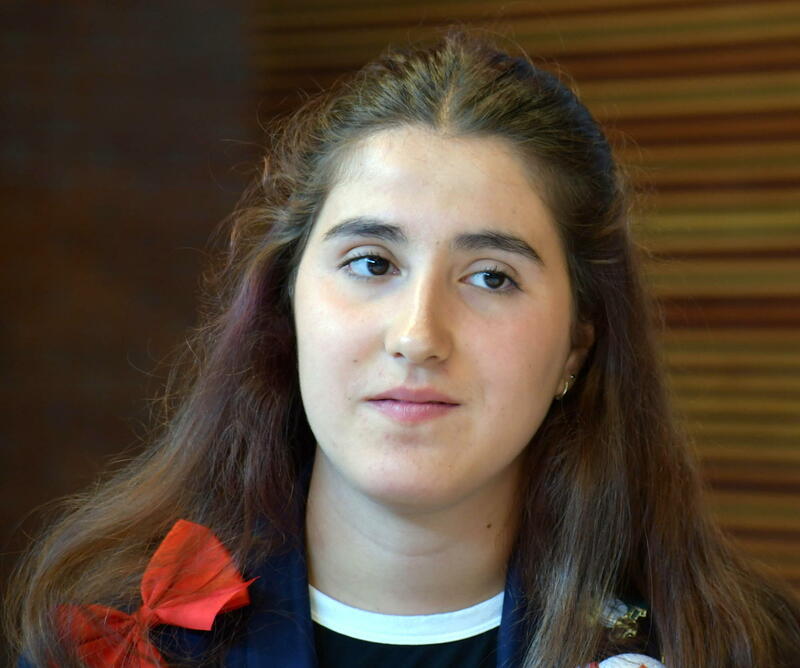 When she returns to Argentina, Clara plans to finish high school and go to college. LATE BREAKING NEWS: You have probably heard about the devastating volcano eruption in Guatemala that killed dozens of people today. Auggie Gonzales, coordinator for the club’s annual Guatemala dental mission, has been in touch with contacts there and says that folks who live the towns served by the mission are okay. However, the Antigua Rotary Club, which coordinates the mission there, is asking for help for the affected towns. More information on ways to help will be available at Wednesday’s meeting. 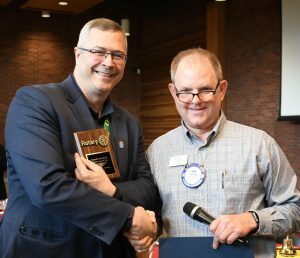 PDG Mike Caruso made 3 Paul Harris awards at last week’s meeting, recognizing those who give at least $1000 annually to the Rotary International Foundation. 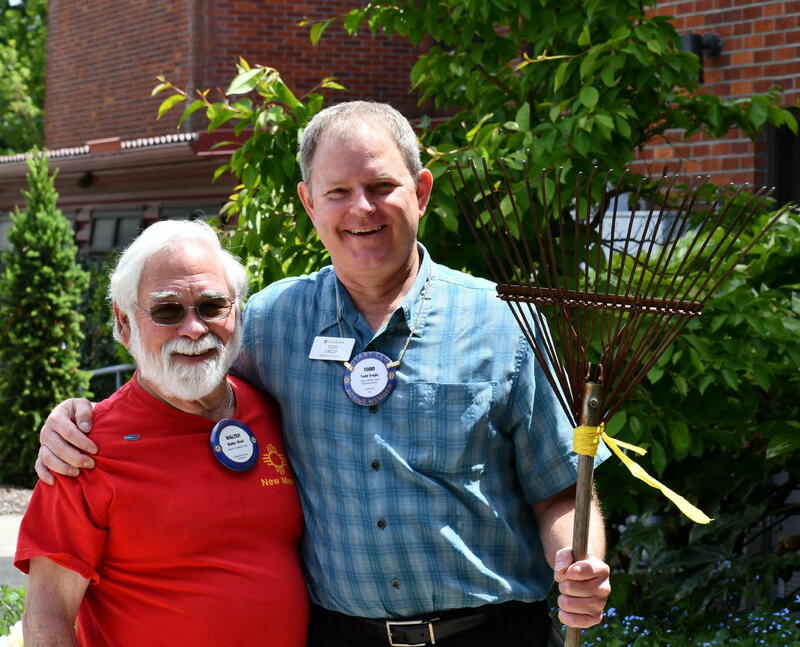 Mike said our club is the #2 Paul Harris Society club in District 5100 in terms of donations. 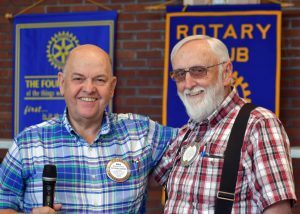 Congratulations to LeRoy Benham (above left, with Mike) on his standing as a “Paul Harris +7,” which means he has given in excess of $8000. 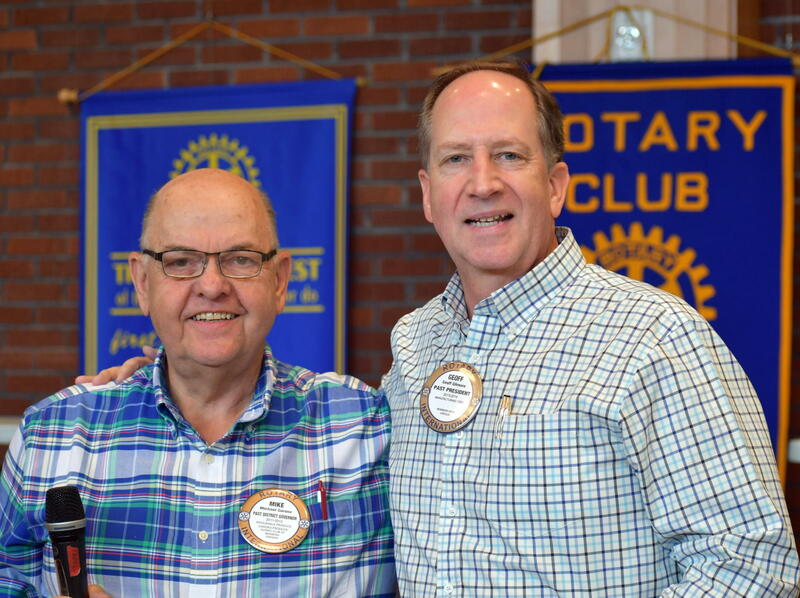 Dr. Eric Bergquam (below right) received a pin for being a “Paul Harris +5,” meaning he has donated in excess of $6000. 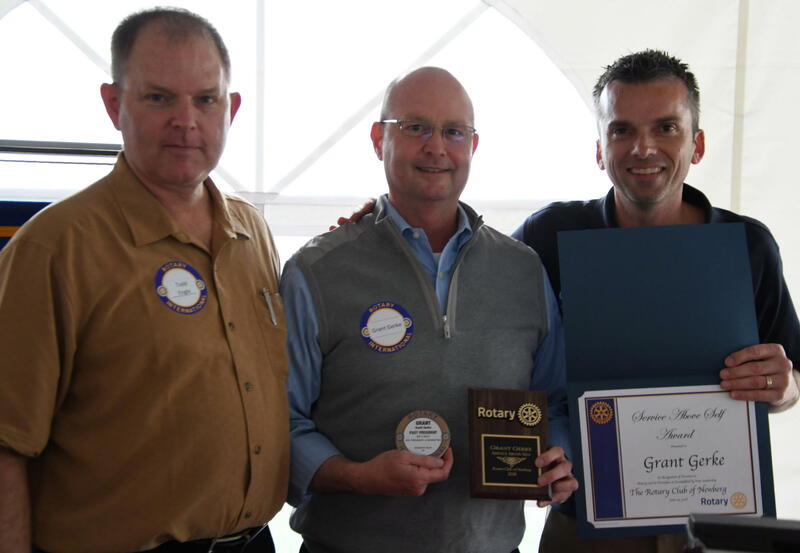 And Geoff Gilmore (below) was recognized for being a “Paul Harris +4,” giving in excess of $5000. Volunteers are needed June 8 and 9 to address envelopes for thank-you notes to our auction sponsors, and to enjoy some time with other Rotarians while doing so. You will be rewarded with either dinner on the 8th or brunch on the 9th, and are guaranteed to be well-fed! That’s because Auction chair and gourmet cook Denise Bacon is providing dinner on the 8th (6 to 8pm) and brunch on the 9th (10am to noon) at her house. To sign up, please see the recent email or contact Denise. Shannon Buckmaster is looking for 6 good volunteers for a Saturday in September to help with a home build for Habitat for Humanity. Minimum age of 14 to be at the site. Training, equipment and lunch will be provided. For more info and to volunteer, please contact Shannon. 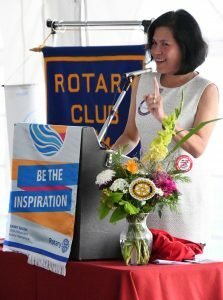 Michelle Bechtold from the Early Birds Club introduced our speaker. 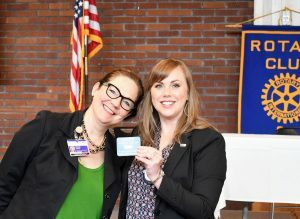 Visiting last week from the Early Birds Club were International Exchange Student Program co-chairs Michelle Bechtold and Elizabeth Still. 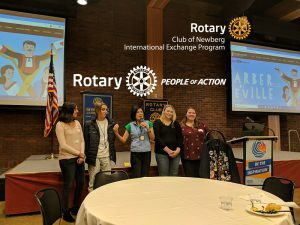 Michelle introduced our speaker and thanked our club for supporting the exchange program. 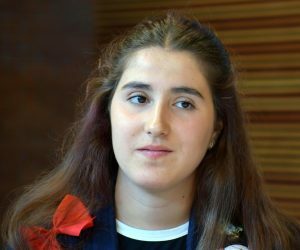 Exchange students Danielle Bosse, who went to Argentina, and Nevres Eryigit, here from Turkey, attended to support our speaker. Time to buy your tickets for this fun annual event (with great wine!) coming right up at Methven Family Vineyards. Come bid Todd Engle farewell as our president and welcome Om Sukheenai as our new leader. Social hour starts at 5:30pm; dinner at 6:30pm. Bon Appetit will be catering–so you know the food will be delicious! 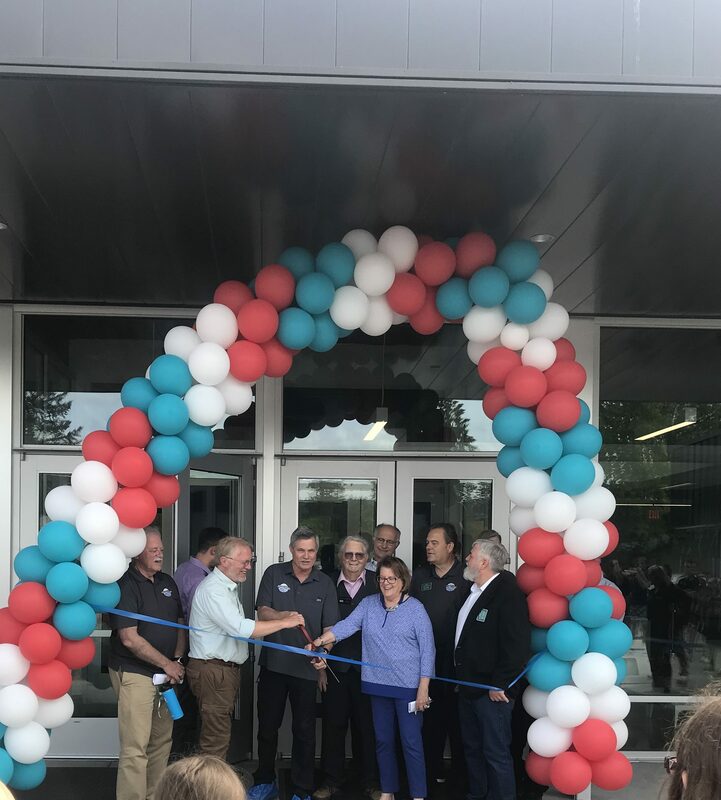 Past President Jim McMaster shared that the much-anticipated Grand Opening of the community’s new Aquatic Center will be this Thursday, June 7 at 3pm. Let’s hope Jim gets his life back after this event! Jim also shared that his son Spencer is earning money for college by working at a camp for special needs kids in the mountains of Santa Cruz, CA this summer. A pat on the back to Dan Keuler , who recently received “Rookie of the Year” honors from the City of Newberg. And Dan’s wife was recently appointed to the school board. How’s that for a civic-minded family? And –their baby son Jackson can now sit up and clap his hands. Rick Kaufmann has returned from a three-week visit with his son in Vermont. He attended meetings at some Rotary clubs while there, and brought us club flags from the St. Johnsbury, VT club and the Littleton, New Hampshire club. Thanks, Rick. Dr. Stan Kearns announced that he had recently celebrated his 62nd wedding anniversary. In commemoration, he made a generous donation to the Duck. Thank you and congrats, Dr. Stan. 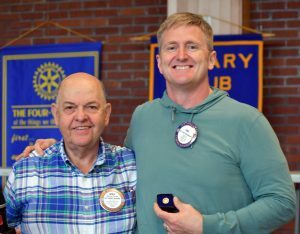 Just when you think you know somebody……Auggie Gonzales revealed he had received the “best tango dancer” award when he attended the Rotary International convention in Buenos Aires as incoming president of our club a number of years ago. Who knew?